This compact version of Voodoo Tactical's popular Scorpion Range Bag offers the same great features as the original, but in a slightly smaller size. It's perfect for carrying a couple of handguns, as well as ammo, cleaning kits, and other accessories. Made of the same heavy padded nylon construction with “cross-cut” stitching as the original Scorpion, it has a single locking two-way zipper that allows easy access to the main compartment that features a full-length padded open pocket with ID window, two padded covered pockets, and elastic loops. 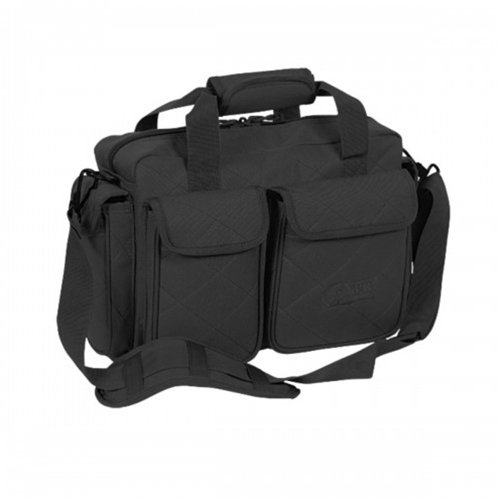 External pockets on the front and sides allow for additional storage and organization of your gear. Once you're loaded up, use the removable, adjustable shoulder strap with sliding shoulder pad or the wrap-around carry handle to haul your bag to its destination. Measures 16"L x 7"W x 11"H. Weighs 2.25 lbs.